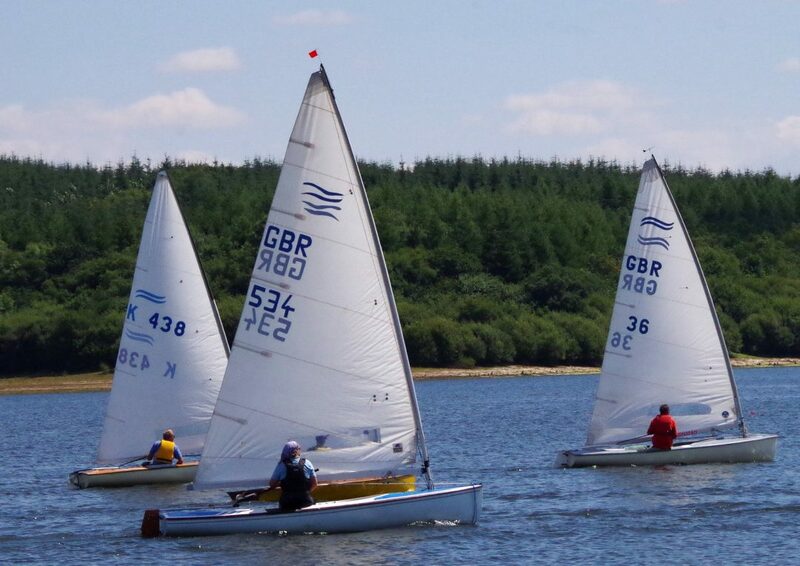 Four classic Finns sailed in the CVRDA event at Roadford Lake in Devon over the weekend of 24/15 July. John Barnes came over from the Isle of Wight with his Vanguard, sail number 36, Paul Peggs travelled back to Brittany to collect his 1978 RA Scales composite Finn, K438, Vanessa Weedon-Jones brought her GRP Taylor K469 (sail no. 534) and Peter Vinton sailed his wooden Fairey, K197. All sailed with Needlespar masts except Peter who used a wooden Bruder mast. With hot sunny weather and a good breeze in the afternoon Roadford was at its best and on Saturday 3 races were held in the middle of the lake. Peter started each race in front and in the first 2 races was only overtaken by the Javelin and Osprey. In the 3rd race John Barnes got past on the penultimate leg but Peter got back to cross the line together. On Sunday in a lighter breeze more of the lake was explored in the first race and again Peter led the Finns around. The course was shortened for the next 2 races but Peter had to leave and John took over the role of leading Finn in each race. Overall Peter was 1st Finn in 4th OA, with John 2nd and Nessa 3rd. The Classic Finn Nationals will take place at Oxford Sailing Club on September 8-9th, don’t miss it!